luxor throw finished – but why luxor? This Thursday I am flying to see my Mum in Prague. 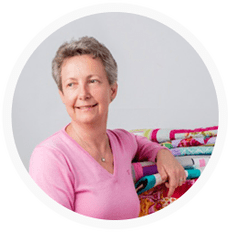 Looking forward to that, I can visit a few patchwork shops and get some quilting threads. 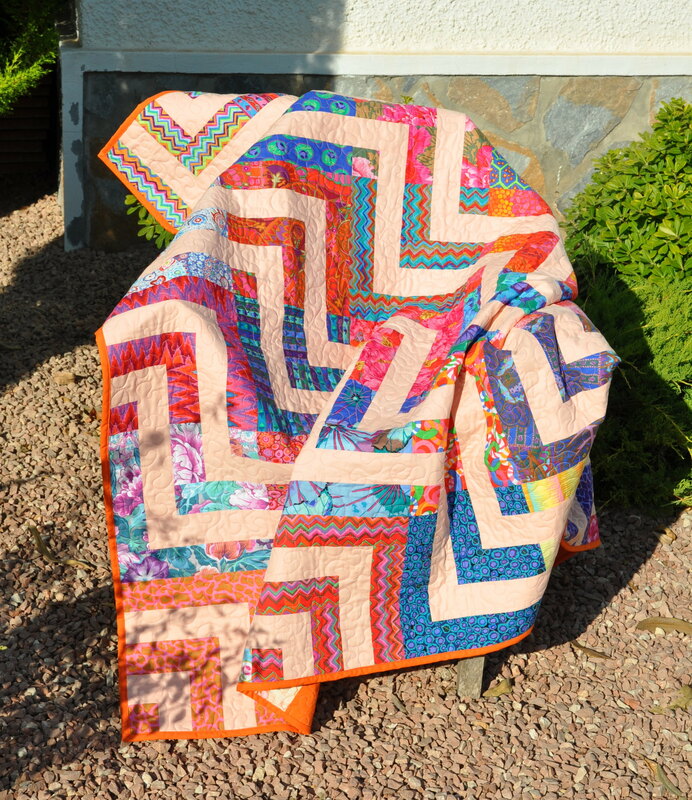 When I come back home I have quilting work waiting for me – a double bed quilt in the QAYG method. 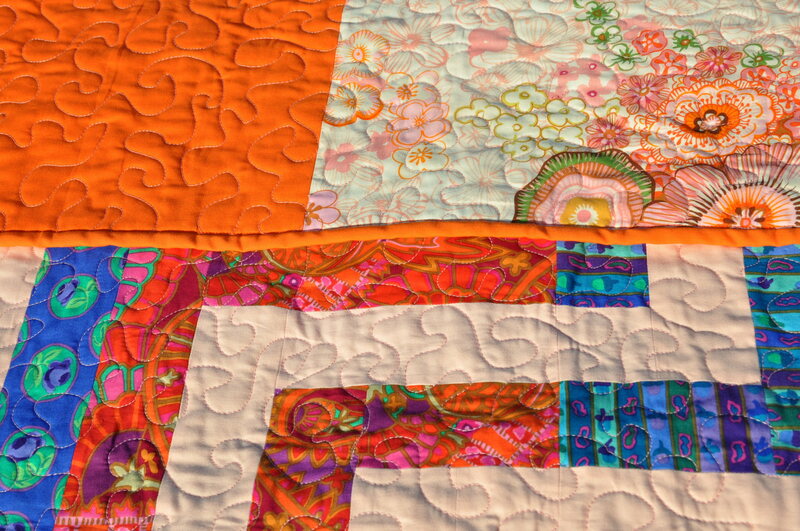 This kind of quilting I can manage well on my Bernina sewing machine. In the meantime I have finished quilting and binding the Luxor throw. Now – why the name Luxor? During my last visit to Prague we went to one of the largest book stores that is directly in the heart of the city on the Wenceslas Square and this building is called Luxor Palace. 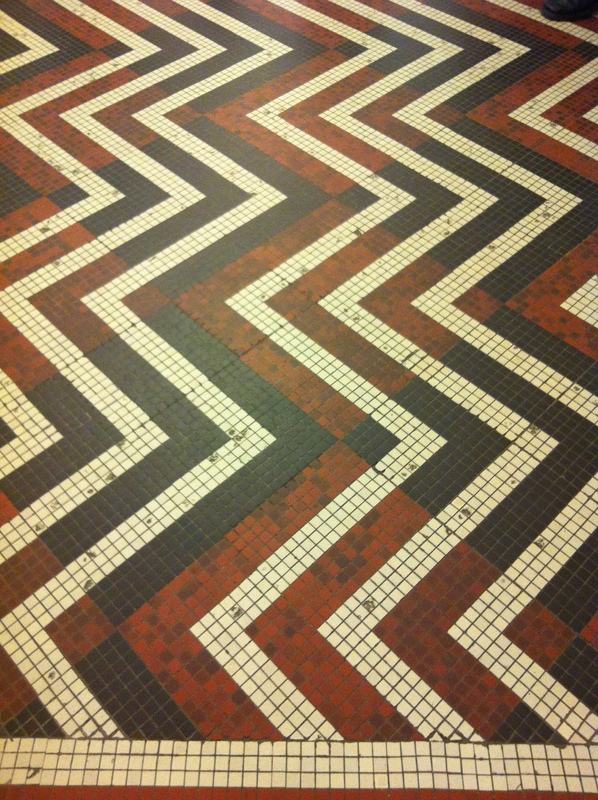 Here I spotted an original floor mosaic and I couldn’t resist taking a photo. This entry was posted in inspiration, my quilts, quilts and tagged finished quilt, log cabin, pillow case. Thanks for stopping and leaving such a nice comment! Love the quilt and inspiration behind it. Hope you have a lovely time while visiting your Mum! Congrats on the beautiful Luxor and chevron finishes, Barbora! They are both very sweet and I am sure your mum will love that adorable pillow. Congrats on your 100th post, too! I just started following on Bloglovin’ so I will have to do some backtracking and then I’ll be on board when you next 100 come along. Happy Holiday! Hi Lorna, thanks for your nice words! Looking forward to see your new projects! You do such great things with chevron! I think the color palette is probably the key, but I love the contrasting-shapes-with-similar-angles effect you have going on. Do you know Kollabora.com, the crafting community? We just added a quilting sub-community, and I’m pretty sure the people in it would go crazy for this. I’ll check your website as soon as I am back from holidays! Your quilt looks great and congrats on your 100th post. Thank you very much, I’m taking a small break, but shall be back in a weeks time. I have been there in Praque too and loved it! Your luxor quilt is amazing. Such a great color choice and beatiful meandering. Big compliments! Thanks for stopping and leaving such a cheerful comment! Looking forward to see your blog growing. Yay! 100th post – congrats!!! Love this quilt and you know I love the inspiration photo!! Amazing!!! Thanks for your comment, looking forward to write the next 100 posts. Wonder how long will it take me. Happy travels. I like both the floor and the quilt! The pattern looks like a good way to use floral fabrics, keeping variety under control with color choice and the constant white. Thanks for stopping. I think the solid fabric breaks the floral prints so that they do not completely take over the quilt.